Ortelius’s maps were always regarded as a reference. Praised since its publication in 1570, his work: Theatrum Orbis Terrarum is considered the first atlas, the first systematic compilation of maps that, also, marks the start of the Flemish school, the model for the 16th century’s cartography. Ortelius –collector, antiquary, and cartographer– was the first to quote the 87 cartographers who drew the maps that appeared in his Theatrum. Maps that were chosen from his vast collection. With the discoveries of its time, the Theatrum grew in each edition. It contained 53 maps in 1570, 64 in the Latin edition of 1571, and 67 in the Dutch edition of that same year; 70 maps in the 1573 edition, 108 in 1592, 115 in 1595, and 167 in 1612. In 1545, Pedro Apiano mentioned the importance of geography for the students of historical biography. In the same manner, in 1570, in the opening lines of the Theatrum, one can read the saying: “Geography is the eye of history,” that, in some way, has remained until today. By publishing the abridged version of the Theatre of the World, (Epitome orbis terrarum), it was translated almost immediately with a great success due to the quality of its printed maps. Thus, Ortelius contributed to establish the geographic space as the theatre of human activities. Major Atlas; Printed by Juan Bleau, Amsterdam, 166? The first geographic atlas, acknowledged as such, appeared in 1570. Ortelius compiled a set of maps in a systematic way in order to copy and publish them in an anthology. It was Mercator, in 1589, who used the name Atlas for the first time to call his collection of printed maps. It was a time with the necessary conditions for the development of maps, not only sailors and merchants needed them, but also citizens interested in the world beyond their horizon, and with the capacity to acquire luxurious atlas and beautiful earthly and celestial globes. In the 17th century, the most notorious cartographic atelier was the Blaeu house, which earned an enormous fame because of their big geographic atlas, to such degree that one of their works, the Major Atlas, is included among the fifty most important figures, creations, and events that make up the canon of Dutch history. Willem Blaeu, Tycho Brahe’s apprentice, inherited the enterprise to his son Joan, who tried to publish a real cosmography, a complete description of the known heavens, lands, and seas. The title was Major Atlas, or the description of the world, where the earth, the sea, and the sky are presented and described. The editions of the Major Atlas contain the description of the countries only. The seas and the sky, unfortunately, were never printed. Pedro García Farfán arrived to the New Spain in 1557, he first lived in Oaxaca, then in Puebla, and, afterwards, in Mexico City. His pilgrimage allowed him to discover the customs of the indigenous population, in order to get near their healing methods. He graduated as doctor in the Pontificial University of Mexico, in 1567, and two years after the demise of his wife, he took the habits of the Augustinian order, taking the name of Agustín Farfán. His merciful work and the focus of his attention were to help the men in the spirit, as a religious, and in the body, as a doctor. His fame transcended, and in 1579 he published his work: Brief Treatise of Anatomy and Surgery and of Some Diseases that are Common in the New Spain, the acceptance of the book was such that Pedro Ocharte reprinted it in Mexico City in 1592 with some amends. Brief Treatise of Anatomy and Surgery… is a practical and safe medical guide, with over five hundred pages, it was meant for romance surgeons, barber surgeons, and everyone who: “were far from the cities and large villages.” The subjects in the six parts, or treatises, contained within are “Anatomy,” “Swellings,” “Tumors from Head to Toes,” “Fresh Ulcers and Wounds,” “Ulcers” right next to “Burns,” and “Bubo” (syphilis), and “Some Diseases that are Common in this Land.” Farfán’s work is not a summa, or a compendium, but a veritable “Brief Treatise” that stands out from others because it is practical, and because it exposes the doctrinal aspects, the clinical profiles, and the operatory procedures adapted to the circumstances of the society of New Spain. These are the first books that join the traditional Pre-Hispanic medicine with the Arabian galenism. The objective of Farfán’s work is the medical intention, not the chirurgical; this is the reason why the virtues of Mexica “medicines” are highlighted, not only the vegetal, but also some animal and mineral, which dominate most of the recommendations. Farfán’s praises to the “mataliztic” are frequent (Commelina tuberosa L. and other species of this genus): “It is of the noble and safe purges of this land, as I have experimented on many occasions.” In addition, thanks to this treatise, the therapeutic uses of cocoa were introduced in Europe. In the Brief Treatise of Anatomy and Surgery…, the uses and remedies of plants are considered as well as described in a scientific, practical, and healing form, the reason why his work is considered the symbiosis of cultural intermixing and of the medicine of 16th century New Spain. Elvia Carreño Velázquez/Libraries and Ancient Books, ADABI, A.C.
Johann Wilhelm Weinmann was a renowned German apothecary and botanist, not only because of the creation of a botanical garden in Regensburg, and the publication of the Catalogus Alphabetico ordine exhibens Pharmaca in 1723, but also because of his important bibliographical work: Phytanthoza iconographia, printed in four volumes between 1737 and 1745. In the middle of the 18th century, illustrations in books became more important and were an essential part of the development of sciences. In the case of the botanic, Linnaeus’s proposals and the increasing knowledge of the plants in each continent required, for their description, classification, and study, more detailed images of the vegetables. Phytanthoza iconographica is a magnificent collection that shelters over one thousand engravings on vegetation of the southern part of America and the southeast part of Africa. Hand colored prints with an enormous quality in their authenticity and chromatic precision of the sample. The careful edition of Phytanthoza iconographica, from the typographic German cover in two colors, to the splendid engravings, were the reference for the most complete botanic of the 18th century. In a first stage, the botanist Georg Dionysius Ehret, who started out as a gardener, and in time became one of the most influential artists, who worked in Carl Linnaeus’s illustrations, made the prints of the book. In the second stage, a group of renowned artists such as Bartolomé Seuter, J.E. Ridinger, and J.J. Haid, participated. Towards 1543, the dissection of human bodies was forbidden; everything it was known of human anatomy was deduced from the dissection of animals made by Galen. This changed when Andreas Vesalius began his studies in Paris and felt the need to know the secrets the human body hid. He went to the Parisian cemeteries in the middle of the night, stole corpses and studied them, breaking the law. However, in Padua, Italy, the Pope Sixtus IV emitted a bull at the end of the 15th century that allowed the local bishops to hand the bodies of those who died while on interrogation or in jail to the anatomists and artists. Vesalius finished his studies in the famous medical school of Padua, where he was appointed head of anatomy and surgery, and, for five years, he did nothing but dissections of human bodies. Day after day, Vesalius stood in the center of his dissection room of the University, saturated with the smell of mystery and decomposing flesh, surrounded by students who crowded the seats. While he slowly opened the corpse on the table, he revealed the mysteries of the human body, which did not correspond to what they all learned in Galen’s texts, the Gospel of medicine until then. In 1543, and despite the accusations of heresy upon him, for contradicting what was then accepted as the truth, he decided to assume a greater risk: to publish the fruits of his research in Johannes Oporino’s print shop. De humani corporis fabrica libri septem, which means seven books on the structure of the human body, the first atlas of human anatomy of the world, made up by 726 pages, 289 illustrations, 187 capital letters, and 189 chapters. A fabulous work considered by great medics as the best medicine book ever published. With it he changed the way the human body was depicted, and for the first time, man was seen by man. The book was not the triumph of anatomic studies only, but also of the art of making books, we talk about a milestone in pedagogy, anatomy, and in the art of publishing. If he had not written this book, we would know nothing about Vesalius, and nothing about our interior. Its beauty attracted people, they valued the information, and because of this, Vesalius is acknowledged as the father of modern anatomy. Elvia Carreño Velázquez / Libraries and Ancient Books, ADABI, A. C.
Juan Caramuel was looking for a complete organization of the knowledge of the world, focusing his particular interest in the creation of a cursus mathematicus, divided into four parts: ancient math, new, architecture, and astronomy. Out of this enormous project, the Mathesis Biceps, published in two tomes in Latin, corresponds to the first parts (vetus: old, nova: new). The Mathesis is divided in 40 subjects, becoming the most ample and complete exposition of the knowledge that in the 17th century were considered part of mathematics. Some of the contributions of this work are the treatment and use of logarithms, the theory of the combinatory that extends to the theory of probability, and the invention of binary calculus, which was attributed to Leibniz. The frontispiece inspired in some of the works that Caramuel knew is worth mentioning. The figures on the corners represent geometry, with Euclid (upper left), the optics and perspective with Witelo (upper right), architecture with Vitruvius (lower left), and fortification and military engineering with Archimedes (lower right). This edition belonged to the library of the Jesuit school of the Holy Spirit, and was taken to the Palafoxiana Library, with other works, after the suppression of this order in 1767. In the 16th century, the knowledge of plants in ancient Mexico was so important that three masterworks were elaborated: the Codex de la Cruz-Badiano, created by the indigenous Martín de la Cruz and Juan Badiano; the Florentine Codex, based upon Bernardino de Sahagún’s monumental work; and the Rerum Medicarum Novae Hispanae thesaurus by Francisco Hernández. Francisco Hernández was an outstanding Spanish doctor who related with illustrious figures of sciences, the technique, and the arts, such as Andreas Vesalius, Juanelo Turiano, Juan Herrera, and the prominent polyglot Benito Arias Montano. Hernández was an expert in different scientific areas such as medicine, botanic, geology, and cosmography. Knowledge that enabled him to be appointed as Phillip II’s chamber doctor in 1567, besides performing one of the greatest scientific endeavors of the 16th century. Hernández’s work: Rerum Medicarum Novae Hispanae thesaurus was the result of the first scientific botanic expedition with the objective of exploring the New Spain’s flora and fauna, in 1570. For seven years, Hernández described over 3,000 plants and 500 animals, and about 40 minerals used in Pre-Hispanic medicine. This research was recorded in 17 handwritten volumes kept in El Escorial Library. Despite the originals were lost in the fire of the Spanish library, in 1671, several editions remain in different libraries, one of them, the second edition from 1649, is kept at the Palafoxiana Library. Illustrated text with xylographic engravings which allows us to discover the richness of ancient Mexico’s plants, animals, and minerals, and, foremost, to value the most important antecedent of the botanical expeditions of the 18th century. In 1684, Edmund Halley visited Newton in Cambridge in order to ask him about the movement of the planets; he immediately answered, because he had already analyzed this subject before. Halle insisted Newton to prepare his discoveries for publishing. Despite Newton’s bad temper, and that he did not like to publish his ideas out of fear of being criticized, Halley convinced him and financed the first edition, which consisted of about 250 and 400 books, published in London in 1687. This book is considered one of transcendence for humanity, because the mathematic laws for the movement of the bodies were presented for the first time, besides declaring that the force that makes things fall is the same that makes the Earth revolve around the Sun: gravity. The Palafoxiana Library has several works by Newton, being the 1714 edition from Amsterdam the most important, because it reproduces the second authorized edition from Cambridge (1713). Some Dutchs, motivated for the great interest this work aroused, got to print a bootleg version of the Principia, without the authorization of the author, which allowed a more ample dissemination of the Principia in Europe and in America. The edition in the Palafoxiana has a note of the review made by a censor of the Inquisition in Veracruz, on April 1st, 1724. As far as records attest, this is the oldest edition of a work by Newton that arrived to the New Spain. René Descartes has entered history because of his contributions in philosophy, natural sciences, and mathematics. One of his most important works is La Géométrie, published in French in 1637, as one of the three scientific essays at the end of the Discourse on the Method, translated and printed in Latin until 1649. The Geometry is the first book in the history of mathematics that shows the relation that the algebraic expressions have with curves; besides of a symbolic notation that facilitates its understanding and use. This approach by Descartes gave origin, formally, to analytic geometry. Since the first edition was in French, a Latin edition was necessary for the scholars of the time. For this reason, the Dutch Frans van Schooten (1615-1660), a mathematics professor at the Leiden University, published his commented translation in 1649, where he included the notes that Florimond de Beaune, a great admirer of The Geometry, sent to Descartes. For the second edition of this translation, van Schooten included the contributions his students made: Johan de Witt, Johannes Hudde, Christiaan Huygenes, and Hendrik van Heuraet. The Palafoxiana Library edition of The Geometry is the fourth edition (1695) of van Schootens version, with notes by Florimond de Beaune and treatises by Hudde’s (Reduction of Equations, and Maximums and Minimums), and van Heuraet (Transformation of Curves into Straight Lines). Six planets were known: Mercury, Venus, Earth, Mars, Jupiter, and Saturn. There are only five regular solids: the tetrahedron, the cube, the octahedron, the icosahedron, and the dodecahedron. Why were there only six planets? Why five solids only? Kepler thought there had to be a relation between them both. There are five spaces between the six planets where the five regular solids had to fit in. In the sphere determined by Saturn’s orbit, he placed a cube, and inside the cube, the sphere corresponding to Jupiter, followed by the tetrahedron, which contains Mars’s sphere. Then, the dodecahedron, followed by Earth’s sphere, and the icosahedron inside. Then, Venus’s sphere containing the octahedron that, in turn, contains Mercury’s sphere. It seemed everything was solved. Kepler set forth this idea in the Cosmographic Mystery (Mysterium Cosmographicum), when he was only 25 years old, one of the first attempts to establish the laws that ruled planetary motion. An idea that was not functional, but meant a motivation in his labor, which led him to establish the three laws of planetary movement that carry his name. In 1531, Pedro Apiano, German humanist, mathematician, instrumentalist, and astronomer, noticed that the tails of the comets always point in the opposite direction of the Sun. This observation, published in Practica (1532), is considered the start of the scientific observation of comets. Although his previous observations, such as the Cosmographia, contained little original material, in that time were useful as an introduction to science for a non-specialized public. Besides dealing, always within the Ptolemaic system, with the movement of planets, Earth’s geography, sailing techniques, the measurement of time, and the determination of distances, it includes engravings and wheels, known as volvelles, mobile paper charts used to make calculations. It was in astronomy books where these tools first appeared. In the Cosmographia, Apiano also talks about instruments that were used to, for example, make observations and measure time at night, and uses the instrument called: alidade, to measure the lunar distances. Everything pointed out that we had to be at the center of the Universe. Everything moves, Sun, Moon, planets, stars, but us. At least that is what it seems. If Mars had had a moon as big as ours, we would have noticed that it revolved around the planet, but no, Mars’s two moons are small, and cannot be seen on plain sight. Or, if our Moon had different rotation and translation periods, we would see different parts of the surface and we would notice the rotation, an indication to surmise that not everything moves around us. Then, how did we arrive to the present idea of the Solar System? It was until 1543, the same year of his death, when the Polish astronomer and priest Nicolaus Copernicus published De revolutionibus orbium coelestium (On the Revolutions of the Celestial Spheres), a completely different theory to explain the apparent movement of celestial objects. It proposed that the Sun, and not the Earth, was at the center of the Universe. Earth became the third planet in relation to the Sun, moving in a circular orbit. The Astronomia Instaurata (Restored Astronomy) is the third edition of De revolutionibus. Seventy-five years after the death of the author, the “restored and elucidated [publication] with notes” of the hypothesis that revolutionized science is, maybe, one of the most important ideas and consequences in the development of scientific thought. 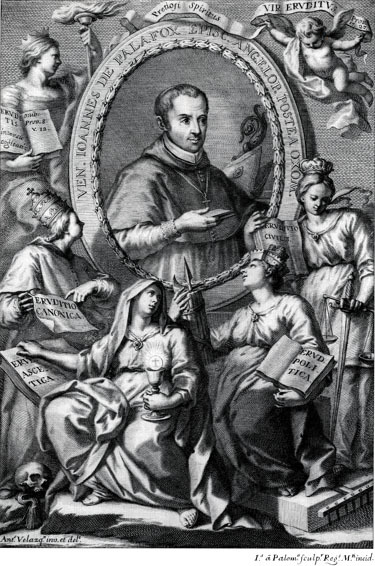 The only book printed in New Spain and dedicated to the teaching of philosophy and physics was Recentioris Elementa Philosophiae (Elements of Recent Philosophy), by Benito Díaz de Gamarra. The author, having studied in both New Spain and in Europe, returned to Mexico and wrote this important work. In it, he outlines the latest knowledge and ideas he had obtained in Europe and he presents it to students in two major branches: philosophy and physics and including an introduction to Euclidean geometry. The structure of the Elementa shows modern thought and intends to convey it likewise to students. Some professors at the time did not receive the work well and even tried to accuse the author in front of the Spanish Inquisition. The edition in the Palafoxiana Library includes a separate sheet by which researchers know that the book was reviewed by the Inquisition though it seems to have passed without criticism. In the margins, a handwritten note informs us that this volume was in the possession of Lieutenant Colonel Agustin Beven. Beven was himself repeatedly denounced for the possession of forbidden books. At the foot of the pedestal bearing the portrait of the author, accompanying the cover of the book, is a book beneath a compass. Here one can read “Newton Op,” that is Work of Newton in reference to the works which most influenced the scientific parts of this book: The Mathematical Principles of Natural Philosophy and Optics. In its day, that earlier work was a novelty in the New Spain. Vitruvius is one of the most important Roman architects. His treatise, Ten Books of Architecture (De architectura, 1582) is one of the only examples of the art of building prior to the Middle Ages. He covered topics ranging from ornament to machinery, with a complete picture of what is meant by beauty, in respect to proportion, harmony, appropriateness of form, use of color and use of painted murals. Architects, sculptors and painters, including Leonardo da Vinci, relied on the books for older models and techniques and for the proper use of the Greek and Roman orders. Despite the rigid systematization of art throughout the 16th century, new conceptions could still emerge. Especially with the discovery of the ruins at Pompeii and Herculaneum, a new look at antiquity was inspired. And a wide distribution of prints and texts on their importance and beauty soon followed. Texts published by Johann Winckelmann after 1745, especially “Esposte Antichità di Ercolano,” strongly influenced thought and new thinking on the concept of the beautiful. For German philosophy and art history, the Ancient Greeks had been uniquely able to reach an ideal beauty because they created an art with a high moral value. Opposing any sensualist view of art, they presented the idea that the ancient city was able to realize their social and moral ideals in art: sculpture, bare white marble by Praxiteles should be imitated and should serve as models for moral education and the formation of an artistic sensibility. The series of eight books on the antiquities discovered at Herculaneum and published between 1757 and 1792 offered 18th century artists and intellectuals a clear example of the concepts raised by philosophy. The engravings faithfully reproduce works discovered in archaeological excavations that began in 1711. From the 16th to the 19th century, art was established as the mastery of technique with respect to the rules, established by the Academy and acknowledged by peers. This, though, did not remove the tremendous creativity of the human spirit. This was reflected through works and truly innovative texts, such as those of Jesuit scholar, Athanasius Kircher. One of the greatest scientists of the 17th century, his works of research and discovery developed into an encyclopedic knowledge of the sciences of man and of nature. These were guided by the rigor of study as well as through his own fantasy. The famous Musurgia Universalis, published in two volumes in 1650, is one of the most important works to attempt a general explanation of music and its rules. Beginning with natural sounds and an idea of a cosmic harmony governing order in the world, Kircher studied a general concept of music in his era, via a pseudo-scientific methodology of empirical analysis, one which will be re-visited later in some of the foundational works of physics and biology. He drew, as well, on the mechanics of musical instruments and human anatomy to explain and justify the rules of harmony, melody, and polyphony. The importance of this treatise can be seen in the works of Bach or Beethoven, among the many musicians influenced by this work. The first volume of the Encyclopedia came to light in Paris in 1751. By 1772, some 35 volumes later, it may well be said that the task had transformed the way the western world reads. Although the project initially sought to make a translation of a similar experience in the English world, Denis Diderot very soon – along with other major thought leaders like Jean le Rond D’Alembert – changed the course of the work such as to instill it with the force that the word “encyclopedia” retains to this day; a universal book that orders, through an alphabetical tour, a set of necessary and transcendental truths for understanding our very “being in the world.” With Diderot’s grand vision, all of the knowledge that preceded us, and all of our capacity to inherit knowledge, would be converted to a textual celebration, to irrefutable science and to common knowledge. Above all, it would put intelligence within reach. In print and engravings, the work of Denis Diderot (1713-1784) made the old dream of summarizing all previous knowledge, from the perspective of a philosopher in possession of a tremendous discipline – indeed of a vast culture! – into one the fundamentals of our passage through life. The creation of a documentary base of the required knowledge, among many other things, ensured that anything said inside could be manipulated. Therefore, the challenge involved not only organizing the selection of all the truths summarized but also called for the drafting of a text whose explanations were lucid, succinct and immune to ideological misunderstandings and, most especially, to religious distortions. The Encyclopedia did not promote an absolute knowledge. On the contrary, Diderot and D’Alembert sensed that each of the “entries” in the Encyclopedia was to mark a place of heightened curiosity. Eventually, the renewal of questions would extend the life of each definition, either by way of confirmation or through the denial of that which had been most lucid. The work sought, above all, to implement a culture of open concepts into the consciousness of France, to organize history for the clarity of the individual, and to never return to the previously inhabited, dogmatic, medieval darkness. The real title of the work extends the scope of its historical resonance: “Encyclopedia, or a Systematic Dictionary of Sciences, Arts and Crafts Produced for a Society of Lettered People” (Encyclopédie, ou Dictionnaire raisonné des arts, des sciences et des métiers, produit par un Société des Gens des Lettres). In short, the true intention of the encyclopedists was to end all forms of dogmatism inhibiting the evolution of consciousness. It is no coincidence, then, that the first volume included D’Alembert’s “Preliminary Discourse” by way of introduction. The text explained the spirit that would guide the drafting of the Encyclopedia. All would have become clear with a statement of intent if those pages had not included the first great encyclopedic spirit in the West but for he who paid huge price in studying reality and reason beyond the dogma: Galileo Galilei. The significance of the great revolution of thought represented in the writing of the Encyclopedia slowly came to light during the “Enlightenment.” It could be summarized as follows: knowledge of reality, of all reality, should not be denied to anyone, and, most importantly, an understanding of the world can never be used as a legitimizing discourse of anything but for that very reason for which it is being analyzed.